Google Chrome is definitely one of the most popular and widespread browsers today. It’s brilliantly fast, stable and efficient, but perhaps one of the greatest things about it is the sheer amount of extensions that are available, designed to make your online experience as easy and efficient as possible. If you’re in the blogging/social marketing business, these add-ons can really make a big difference in the way you work and your overall efficiency. To help you out, we’ve comprised a small list of what we consider to be the best extensions for bloggers and social marketers. So go ahead and check them out! This has got to be one of the most useful chrome extensions, not only for bloggers but for virtually anyone that cares about the quality of their spelling and grammar. Once you turn Grammarly on, it’ll scan the web page for any grammatical or spelling errors in the text. But that’s not all that it can do; Grammarly actually offers suggestions about punctuation and sentence construction, a function that we’ve yet to see available in other spellcheckers, at least at this level. The basic version is absolutely free, so we highly recommend you give it a shot. When you’re doing research online, more often than not you’re going to find yourself opening a lot of tabs, and this can quickly get confusing and messy. Not only that, but if your computer doesn’t have a lot of RAM a load of tabs can really eat up your memory, making your computer sluggish and unresponsive, which inevitably slows you down as well. That’s where OneTab comes in. This nifty little extension can close all of your tabs and replace them with a single one, in which it neatly displays the links to every tab you’ve ever closed in this manner. You’ll never have to look through your browsing history after accidentally closing your tabs and you can easily recall any of them with a simple click instead of keeping all of them open constantly. Your RAM will thank you for it. If you’ve ever had to share an image link or a social media web page link, you know that you have to deal with some long, unintuitive, cluttered-looking links. It gets worse if the other party actually has to write this link down or copy it. Bitly makes all of this a breeze by shortening the link to less than 10 characters, so you can easily write it down or even memorize it if need be. A large part of blogging is actually something called search engine optimization (or SEO as it’s commonly abbreviated), and if you’re in the blogging business you probably already know about it. This extension is designed to make that (sometimes rather tedious) part of your job a lot easier by providing you with a webpage’s rank on Google PageRank, Compete Rank, AlexaRank and QuantCast Rank. It also provides you with some additional, potentially useful information such as IP location, backlinks etc. Tired of constantly having to switch between tabs to share some new article or blog post to social media? Hootlet can be a big help here. This publishing extension automatically shares any desired web page on all of your social networks, so you don’t have to do it yourself. This can really save a lot of time, particularly because you don’t have to wait for all the social media websites to load and then input the web page manually. Sometimes you just need a place to write something down, take notes, or just dish out some text without opening a word processor. Writer comes in really handy here; a simple, lightweight built-in text editor without any fancy features to distract you or slow you down. Definitely a useful tool to have in your arsenal as a blogger. The internet is packed full of distractions that can significantly slow you down whenever you just want to stick to your work and be efficient. This handy little addon helps you out with that by removing any unnecessary page elements such as sidebars and ads, so you can focus on what you need and only what you need. Another time-saving process for anyone who doesn’t like using the built-in Wordpress text editor. With Google Docs to Wordpress, all you have to do is upload your document to Google Docs, and this app will take care of the rest; it will copy it to Wordpress and automatically create a new post with all of your content and formatting in place, without you having to format everything all over again. This add-on can be a life-saver for people that are new to SEO. If MozBar is enabled, every time you do a Google search you will be informed about the Page Authority and Domain Authority of the link you’re about to click on. This is valuable info for any social media marketer or anyone else that needs a backlink to their page. This add-on is still in beta, but it’s nevertheless proven itself highly functional and highly useful. As the name suggests, the extension creates a copy of all your Gmail folders and downloads it to your computer, so you can access it offline. Quite useful if you tend to travel while working and don’t always have access to an Internet connection. 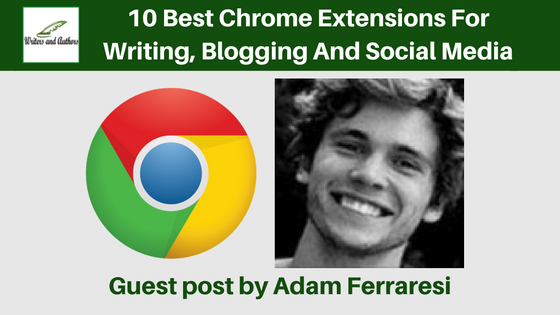 Adam Ferraresi is 23 years old, but he first became interested in writing when he was in high school. Today he’s a successful web developer living in Dallas, Texas, and one of the most trusted writers at The VPN Lab. In his free time, he’s an avid mountain climber and enjoys playing basketball with his friends. Great post. It is necessary to always be in the loop. If you are acquainted with the new thing, you will be in demand. You can always improve your resume. You can write it by yourself or ask for help https://master-resume-writer.com It should show all your strengths.